“…it makes no sense whatsoever for the average Australian family to have to tie up over two-thirds of all their wealth in the world in one highly illiquid and very risky asset: viz., the owner-occupied residence. Australian economics and political forums are full of good-hearted, well-meaning types, who argue passionately, and often cogently, for the need for policy changes to enable lower house prices. Criticism of the Howard Government’s economic policies that encouraged rampant housing speculation and private debt growth is common with these folks. Something I find particularly interesting to observe, is just how many of them are also given to lauding the Member for Wentworth — otherwise known as the “Member for Goldman Sachs” — as somehow representing all they aspire for in a national leader. Apparently, the Australian economy would be magically transformed, our society would heal and “progress”, the national average IQ would rise, reality TV audience share would fall, spelling errors in news captions would cease, and childrens’ severed limbs would grow back, if only the brilliant, eloquent, self-made millionaire, and socially “progressive” Malcolm Turnbull were our PM. Or at the very least, the Treasurer. These folks need to do their homework. Let us take a journey ten years back in time, to the year 2003, and the Menzies Research Centre’s “Summary of Findings for The Prime Ministerial Task Force on Home Ownership” (pdf here). It was chaired by Malcolm Turnbull – the former chairman, managing director, and partner of Goldman Sachs Australia, and co-owner (with Neville Wran and Nicholas Whitlam) of merchant bank, Turnbull & Partners. Which he sold to … Goldman Sachs. Reading this summary report should, all by itself, be enough to convince any honest, open-minded person who (a) remembers the GFC, and (b) wants to see lower Australian house prices, that Malcolm Turnbull is hardly the wonderful, objective, unbiased, clear-thinking, far-sighted, vested-interest-free political saviour that so many gullibles imagine him to be. First, let us consider the identity of the principal author of the report for the Howard government’s Home Ownership Task Force. Christopher Joye. Arguably Australia’s most prominent housing “investment” spruiker. Institutional: Rob Adams (First State Investments), Dan Andrews (RBA), Andrew Barger (Housing Industry Association), David Bell (Australian Bankers Association), Laura Bennett (Turnbull & Partners), Neil Bird (Urban Pacific), Mark Bouris (Wizard Home Loans), Angus Boyd (Foxtel), Jason Briant (The Menzies Research Centre), Kieran Brush (RAMS), Jasmine Burgess (JP Morgan), Alexander Calvo (RBA), Louis Christopher (Australian Property Monitors), Tim Church (JB Were), Bob Cooper (Tobari Management), Tracy Conlan (CBA), Lorenzo Crepaldi (Ebsworth & Ebsworth), Peter Crone (Prime Minister’s Office), Brendan Crotty (Australand), Margaret Doman (Cambridge Consulting), Tony Davis (Aussie Home Loans), Bob Day (Home Australia), Craig Drummond (JB Were), John Edwards (Residex), Lucy Ellis (RBA), Alex Erskine (Erskinomics), Jason Falinski (IAG), Arash Farhadieh (Phillips Fox), Guy Farrands (Macquarie Bank), Lyndell Fraser (CBA), Wayne Gersbach (Housing Industry Association), Steven Girdis (Macquarie Bank), Adam Gordon (Baltimore Partnership), Samuel Gullotta (Goldstream Capital), Michael Gurney (ABS), Jason Falinski (IAG), Martin Harris (First State Investments), Nick Hossack (Australian Bankers Association), Chris Johnson (NSW Government Architect), Alan Jones (2GB), Sally Jope (Brotherhood of St Laurence), PD Jonson (HenryThornton.com), Anatoly Kirievsky (RBA), Caroline Lemezina (Housing Industry Association), Steven Mackay (Ebsworth & Ebsworth), Angelo Malizis (Wizard Home Loans), Patrick Mangan (HomeStart Finance), Geordie Manolas (Goldman Sachs), Ramin Marzbani (ACNielsen.consult), Patrick McClure (Mission Australia), Gina McColl (BRW), Bill McConnell (AFR), Robert McCormack (Allens Arthur Robinson), John McFarlane (ANZ), Bruce McWilliam (Channel Seven), Robert McCuaig (Colliers Jardine), Peter McMahon (Clayton Utz), Alison Miller (Urban Development Institute of Australia), David Moloney (Booz Allen & Hamilton), Ruth Morschel (Housing Industry Association), Paul Murnane (JB Were), Darren Olney Fraser (Australian Public Trustees), Rod Owen (ABS), John Perrin (Prime Minister’s Office), Daniel Pillemer (Goldman Sachs), Dr Michael Plumb (RBA), Dr Steven Posner (Goldman Sachs), Brian Salter (Clayton Utz), Eloise Scotford (High Court of Australia), Tony Scotford (Ebsworth & Ebsworth), Nick Selvaratnam (Goldman Sachs), Tony Shannon (Australian Property Monitors), Matthew Sherwood (ING), Tim Sims (Pacific Equity Partners), Dr Tom Skinner (Redbrick Partners), Arthur Sinodinos (Prime Minister’s Office), Orysia Spinner (RAMS), Bryan Stevens (Real Estate Institute of Australia), Gary Storkey (HomeStart Finance), Arvid Streimann (UBS), Louise Sylvan (Australian Consumers Association), John Symond (Aussie Home Loans), Scott Taylor (ACNielsen.consult), Simon Tennent (Housing Industry Association), Lucy Turnbull (City of Sydney), Nicholas van der Ploeg (Turnbull & Partners), Peter Verwer (Property Council of Australia), Nick Vrondas (JB Were), Colin Whybourne (Resimac), Charles Weiser (RAMS), and Simon Winston Smith (JP Morgan). Finally, let us consider carefully just a few pages of this Summary report. Doing so should enable thoughtful readers to gain a very clear insight into the kind of Orwellian doublespeak, the guile and cunning, the all-pervasive casuistry, that was and is employed by the Merchants of Debt and their cronies, in seeking to rationalise financial innovation, supposedly as a means to help would-be homeowners “benefit from a lower cost of home ownership”. How? By making it easier for them to get into debt, via financing a portion of the total cost of their home through “equity investment”. In other words, a “financial innovation” enabling a transfer of some of the “equity” (ownership) in even more Australian homes, to speculators, through the genius of “investment” bankers. Hopefully, a careful examination of this report may also enlighten some readers as to where our politico-bankster-housing nexus has its roots. No part of the Australian dream is more instinctively human than the desire to own our own home. In recent years, however, that worthy ambition has become harder for many Australians to attain. This is not a function of high interest rates; they are at record lows, but rather is due to a combination of other factors including escalating property prices and, so we contend, inflexibilities in housing finance which limit its availability. So, the basic premise of this report, according to Malcolm himself, was this: Difficulties in obtaining the dream of home ownership are due to limited availability of housing finance + escalating property prices. Ergo, removing the “inflexibilities” in housing finance will take away those limits to its availability, and make the dream more attainable. Riiiiiiiiight. 3 This begs the question as to the absence of equity finance in the first instance. One answer instantly offers itself: securitisation. In the past, it was not practicable for a single unsponsored entity to go around gobbling up interests in individual properties in the vain hope that they could bundle these contracts into something that would look like a regulated holding. Fortunately, there has been spectacular progress of late in terms of the ability of private sector participants to package otherwise illiquid instruments into marketable securities. Do you see what they did there? “Sophistication” = good. “Crude” = bad. Oh dear, those poor, poor consumers; “forced” to use “only the crudest of financial instruments”. Despite “spectacular progress” in “securitisation”. Oh the humanity!! Spurred on by economic and social ructions of this kind, the State and Federal Governments sought to actively expand the supply of housing finance, and by the mid 1930s mortgage markets had arrived in Australia. Without widespread support for these changes, it is doubtful whether they would have materialized at such great pace. Ironically enough, it was bureaucratic inertia of precisely the opposite ilk that was to stifle the growth of trading in mortgage-backed securities some fifty years later. Thankfully, reason prevailed, and today it is hard to imagine what life would be like without alternative lenders and the pressures they exert on the banks. Thank God! “Reason prevailed”, and we finally got … “trading in mortgage-backed securities”. Hallelujah and praise the Lord! In this report, we renew our call for constituents to take the next brave step along the evolutionary housing finance path. It is our belief that there is no longer any need for the household sector to be the poorer cousin of financial markets. That is to say, aspirants should be able to access a suite of debt and equity instruments that is no less rich than that which corporations avail themselves of every day. Wow! “The next brave step along the evolutionary housing finance path”. How could any responsible, modern politician even think of resisting this natural, evolutionary progression? How awful, how immoral would it be, to deny the household sector the opportunity to no longer be “the poorer cousin of financial markets”? In what follows, we undertake four main tasks. First, we offer evidence that irresistible economic logic motivates the introduction of ‘equity finance’. Second, we tender a vast array of new information, drawn from, among other things, survey and focus group data, on the profound socio-economic benefits that these markets could deliver. Third, we demonstrate the proposal’s institutional viability, and pinpoint relatively minor adjustments to the legal, fiscal and regulatory structures that would be required in order to guarantee its success. In the fourth and final section of the report, we embark on a detailed appraisal of the ‘supply-side’ in the context of the debate about the rising costs of housing in this country. Just as we contend that it is vital to extend ownership opportunities to as many Australian families as possible, we also think it is critical to remove artificial constraints on the supply of low-cost properties. All hail, ladies and gentlemen! We have our first oxymoron of the Summary report. Oh yes, about that “institutional viability”. That would be Newspeak for, “All the institutional Merchants of Debt featured in the acknowledgements list love my proposed financial innovation … so it’s clearly viable”. The report itself consists of four distinct ‘parts’. Parts One and Two take up the challenge of introducing the economic rationale underpinning our desire to eliminate the ‘indivisibility’ of the housing asset (which, in layperson’s terms, simply means allowing individuals to hold less than 100 percent of the equity in their home). On the demand side, we conclude that there should be immense interest in securitized pools of enhanced home equity contracts, so much so that it is unlikely that there will be sufficient funds to sate institutional requirements. In fact, our tests indicate that this new asset-category could come to dominate the ‘optimal’ investor portfolio, with conservative participants dedicating at least 20 percent of all their capital to ‘augmented’ housing. Finally, might a liquid secondary market enable other forms of risk sharing and spawn the development of derivative and futures contracts on residential real estate? Of course! “Other forms of risk sharing”, the development of “derivatives and futures contracts on residential real estate”, that’s sure to be a win-win for everyone, right? Oh, wait … remind me again, what happened in 2008? It would appear that the prevailing legal and regulatory framework can flex to accommodate the introduction of equity finance. Most exciting though is the revelation that we can fashion these arrangements as either equity or hybrid debt instruments. The latter is an especially attractive alternative since it enables one to circumvent all of the legal and psychological complications implicit in ‘co-ownership’. In particular, under the debt option, occupiers always own 100 percent of the home in which they live. Furthermore, the costs borne by the institution are noticeably reduced (to take but one example, stamp duty is no longer relevant). In this sense, we can have our economic cake, and eat it too! Yes, sure, just a little bit of “flex” in the legal and regulatory framework. That’s all. Just enough to “circumvent all of the legal and psychological complications”, and so “accommodate the introduction” of my financial innovation. So where are the much mooted impediments to progress? In the immortal words of George Harrison, “Let me tell you how it will be, there’s one for you, nineteen for me.” Our study of the proposal’s institutional feasibility suggests that over-zealous regulatory authorities have the capacity to tax away the gains from trade. Here it is not so much the imposition of new levies, but rather the rigid interpretation of existing ones.8 This was certainly the case with several small-scale efforts to launch equity-based products overseas. Yet what would make these actions especially perverse is that markets of this type present the Federal Government with unprecedented revenue raising possibilities. That is to say, the advent of equity finance would permit the Commonwealth to tax owner-occupied housing for the very first time. Naturally, these charges would only apply to the investor’s holding. In this vein, we would submit that even the most ruthless of bureaucrats should be incentivized to encourage the promulgation of these products. Do you see the cunning carrot bribe being offered by the Merchants of Debt here? Irrespective of what is decided in the post-publication period, we are convinced that the application of both debt and equity finance will eventually become standard industry practice. It is more a matter of whether that day will arrive in the near term or in the far-flung future; and that, truth be known, is a question that only you (i.e., consumers, decision-makers, investors and opinion-shapers) can answer. Unsurprisingly, it is our belief that Australia is well positioned to push the intellectual envelope and become the very first nation to develop primary and secondary markets in real estate equity. And at $2.5 trillion, that is no small cheese. You see? It’s that natural, “evolutionary housing finance path”. It is inevitable, like the rising of the sun. So you best get on board now, and give us what we want; we are going to get it anyway, someday, whether you like it or not, so why not enjoy the ego-stroking (and votes) that will come with being a policy leader in “the very first nation” to “push the intellectual envelope”? Readers will become familiar with our argument that it makes no sense whatsoever for the average Australian family to have to tie up over two-thirds of all their wealth in the world in one highly illiquid and very risky asset: viz., the owner-occupied residence. Indeed, in Part Two of the report we find that one in four families lose money (in real terms) when they come to sell the roof over their heads. For roughly one in ten dwellers, the situation is even more dire – these poor souls are subject to real price declines in excess of 13.4 percent! In this context, it is high time that we brought capitalism to the home front and provided all Australians with the option of issuing both debt and equity capital when purchasing their properties. Bringing “capitalism to the home front”. Now that’s got to be a great idea! Why? Because it makes no sense whatsoever to tie up over two-thirds of all your wealth in one “highly illiquid and very risky asset”. Er … hang on. If the owner-occupied residence is such a “highly illiquid and very risky asset”, then tell us again why would it would be such a great idea to “securitise” a portion of the “equity” in that “highly illiquid and very risky asset”, and sell it to speculators as an “investment”? 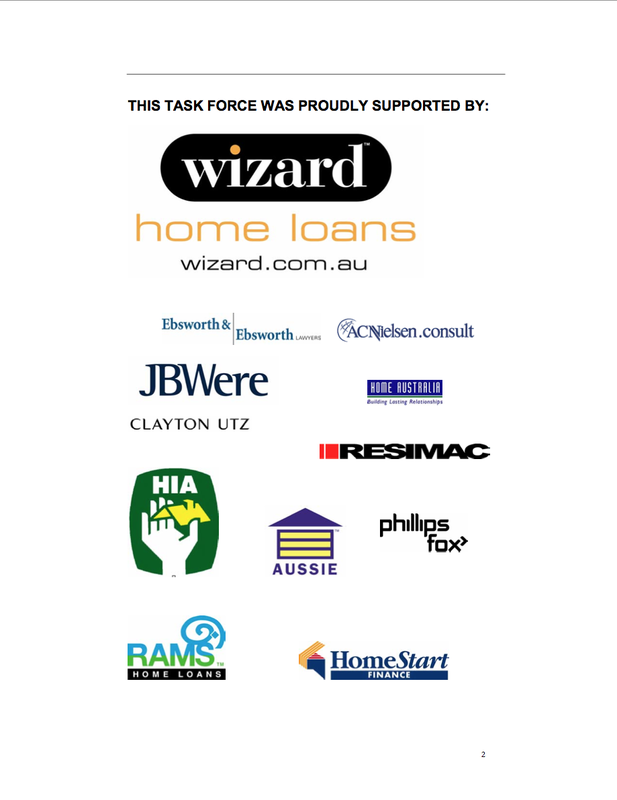 We have had some expenses for assistance with research, computing services and the like and we have therefore been fortunate in receiving generous and much appreciated support both financial and in kind from a number of organisations, including Wizard Home Loans, the Housing Industry Association, JBWere, Booz Allen & Hamilton, Aussie Home Loans, Resimac, RAMS Home Loans, HomeStart Finance, Clayton Utz, Ebsworth & Ebsworth, Phillips Fox, ACNielsen.consult, and Home Australia. A sales pitch to the Howard Government, to allow financial innovation in the Australian housing sector. Innovation of the kind that brought us the Global Financial Crisis. With folks like Goldman Sachs, the Turnbull & Partners merchant bank, and Malcolm Turnbull’s former Goldman Sachs Australia associate, Christopher Joye, leading the bankster cheer squad. The Menzies Research Centre, while affiliated with the Liberal Party, is neither an echo chamber for Government policies nor a substitute for the public service. Our aim is to promote independent, creative and practical ideas on subjects of public importance. Our political perspective is simply that of a commitment to individualism, enterprise and freedom of choice. We recognise that the most challenging social issues are not susceptible to quick ideological answers. We need constantly to promote new approaches and new ideas in social policy as much as we do in science or technology. We believe that these reports do deliver a wide range of new ideas, many of them worked out in considerable, groundbreaking analytical detail. The principal author of that report, Christopher Joye, has since gone on to introduce his Equity Finance Mortgage product, and the leading housing spruiker / real estate investment / funds management firm, Rismark International. He is also a director of Yellow Brick Road (YBR) Funds Management, a company founded by another Merchant of Debt who just happened to feature very prominently in the acknowledgements list of the Howard Government report — Mark Bouris, formerly of Wizard Home Loans. He was speaking of his former Goldman Sachs associate, Malcolm Turnbull. If lower house prices is something that you want to see in this country, then Malcolm Turnbull MP is not your friend and saviour. Australians have an unsustainable debt addiction, which will be hard to kick, and painful to recover from. A new report by CPD fellow Steve Keen has found that in just 18 months time we may be spending as much of the national income on interest payments as we were in 1990 – when interest rates were at 17 per cent. Things are far worse now, since the Labor Government has so dramatically increased public debt, while encouraging even greater levels of private debt thanks to its recently wound down “First Home Buyers Boost”.